I have already learned so much about how to reconnect with my natural intuition in the two episodes I have listened to, it is astonishing. If you were born with the gift of intuition and wish to deepen it, she is a wealth of knowledge. This week we’re joined by Sahara Rose - best selling author, top podcast host of the Highest Self Podcast & speaker. Most people connect Sahara with Ayurveda but in this episode we talk about Sahara’s energy shift away from Ayurveda so she can share more of what lights her up in her life! She talks about this pivot, fear and judgement and the power of being individual. How can we part of the change our planet and community needs? Please share this episode with your friends, family, healers, spiritual leaders and intuitive thought leaders you follow on social media. Let’s start a conversation on how we can come together as a collective to create change. The episode can also be viewed on YouTube and a written transcript can be seen HERE. This Friday’s guest episode we’re joined by Ksenia Avdulova, host of the Woke & Wired podcast, founder of the award winning digital platform Breakfast Criminals and Conscious Social Media changemaker. Do you want to use your social media more intuitively? Are you growing your platform/business and are getting stuck on the numbers? Do you compare yourself to what others are sharing? In this episode we break down how you can use social media to bring in abundance and how being conscious in how you use it can create success. This episode isn’t just talking about using social media for business. This episode goes deep into how we can use it to learn, grow and expand our lives when we use it in a more conscious way. This episode is going to help you “Be the Detective” in decoding your messages. It will show you how to bring out your inner sleuth and take action in your life. In this episode Natalie shares insight and a channeled message from Spirit on the energy for February 2019. She shares how to navigate the energy and themes for the month ahead. Imagination when developing and reactivating your intuition is key. As kids we use our imagination regularly and for most adults it’s part of our brain we don’t use. Imagination creates openness to receive the messages from Spirit. This episode will guide you to reconnect to your imagination - in awake state and dream state. Join the 2019 Intentions with Spirit Online Circle. Jan 16th 2019. Get your spot here. If you can’t join live, a replay link will be sent to everyone. If you can’t join live a replay link will be sent to everyone. This week’s holiday bonus episode is with the super talented Danielle Paige. Danielle is an International Soul Astrologer, Intuitive, Spiritual Teacher, Host of Cosmic Body Podcast and Founder of Purposely Divine: School For Your Soul. A self-taught astrologer, who’s been reading the stars for lifetimes, she continued her studies with some of the world's top astrologers. She then devoted herself to learning different types of healing to create her own style of spiritual medicine. By fusing astrology, energetic healing and intuition, she is able to tap into her clients subconscious and help them heal their wounds, old patterns, and come back home to their heart. This week we’re joined by Rachel Ricketts; racial justice advocate, intuitive healer, speaker + writer. She is an outspoken champion for womxn of colour, educating all hue-mans on anti-racism and inclusion. Her purpose is to help us all better understand our role in perpetuating oppression, of ourselves and/or others, and learn concrete tools for committing to the solution. Rachel hosts online and in-person workshops including her Spiritual Activism series which promotes racial justice, reconciliation and recovery from racialized trauma, and has helped a variety of global brands commit to anti-racism. Her work has been featured in publications such as Huffington Post, Black Girl in Om and Thrive, and she's presented at international conferences including SXSW in Austin, me Convention in Stockholm and the Follow Black Women Conference in Omaha. She loves donuts, dancing and all things metaphysical. Get Guided Online Workshop- 11 days to connect with your Guides. In this episode Natalie shares insight and a channelled message from Spirit on the energy for December 2018. She shares how to navigate the energy and themes for the month ahead. The theme for this month is The Mirror. It’s the first guest episode of the podcast and it’s with my friend and soul sister Ashley Wood. Ep 3: What is your Spiritual Reactivation? November is A NEW ORDER. This is a channeled message and guidance on the collective energy for November. The episode shares how to navigate this energy, what to watch out for and what our souls are being asked to learn in this theme of A NEW ORDER. Hello! Welcome to the first ever episode! In this episode I share what's holding you back from trusting your natural intuitive gifts that you were born with. There's guidance on how to release these blocks so you can start to trust, understand and grow this inner connection. You are intuitive. You were born with this gift and it’s time to return to this inner connection. This is a straight talking podcast, created to help you reactivate, grow and trust your intuition so you can live a more empowered, abundant and connected life. 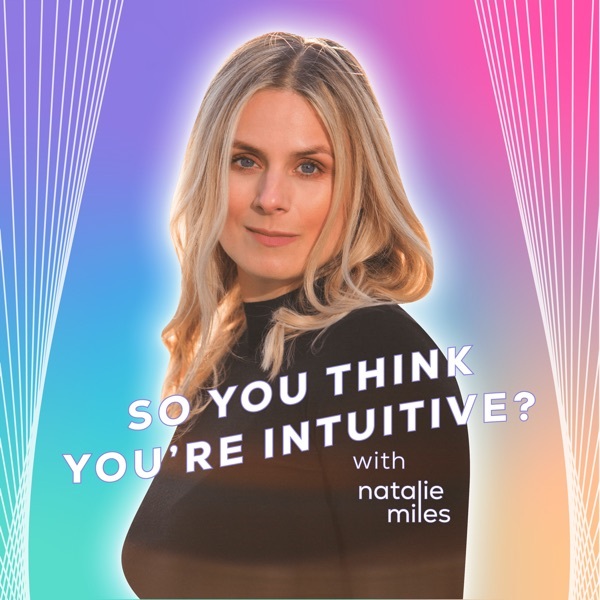 Join Natalie Miles, Spiritual Mentor and Psychic Medium every Wednesday for inspired conversations, guidance, and practical tips on how you can work with your intuition in your everyday life. Episode 1 launches on Tuesday, October 30th. Are you ready for your intuitive upgrade?